A new supernova was discovered recently. Supernova SN 2014J was identified accidentally by a professor and his students (College London) on January 21. It is one of the closest stellar explosion discovered in recent decades. The supernova could reach the maximum light intensity wthin the next two weeks. Supernova SN 2014J is located 12 million light years from Earth (a light year is equivalent to about 9,461,000,000,000 miles). However, the “new” Supernova is the result of a explosion that occurred 12 million years ago, so it’s already a part of the history of the Universe :D.
SN 2014J is located in the galaxy Messier 82 (constellation Ursa Major) known as “Galaxy Cigarette” thanks to its elongated shape. During a practical course with students, Dr. Steve Fossey noticed a star that does not recognize from earlier observations. Due to bad weather, there were only a few pictures of the star, but, later, it managed data’s verification through another telescope. Later, astronomers around the world turned their attention to the indicated place so the supernova was confirmed. The International Astronomical Union has validated the discovery of Professor Fossey and assigned the name SN 2014J to it. The animation was done using two images, the first (10 December 2013) and the second (January 21, 2014) which is highlighted supernova. © Ernesto Guido / Nick Howes / Martino Nicolini. SN 2014J is considered to be one of the closest supernova discovered in decades, the nearest being Supernova 1987A, discovered in 1987, at “only” 168,000 years light. SN 2014J is a Ia Type supernova. It resulted from the explosion of a white dwarf star from a binary system (two stars orbiting around each other). This discovery is particularly important to astronomers because supernovae of this type are used as reference points for measuring cosmic distances. Also, experts hoped that research of this supernova discovered in early stage provide clues about the blast. For astronomy enthusiasts, the good news is that the supernova can be seen with binoculars or a small telescope. 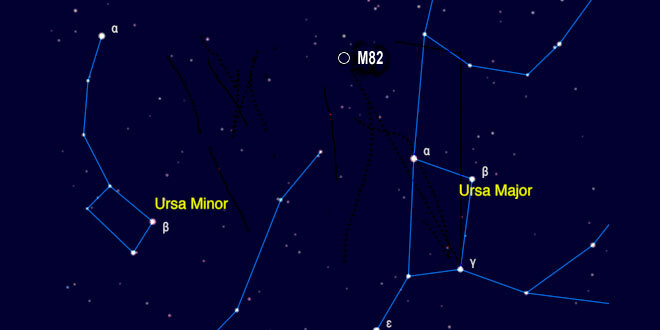 Researchers estimate that the supernova will reach maximum light intensity in the next two weeksand is visible between Ursa Major and Ursa Minor.